Neuronal plasticity is an increasingly recognized, but insufficiently understood feature of the gastrointestinal (GI) tract. Here, in the example of human pancreatic disorders, we present an in vitro neuroplasticity assay for the study of neuronal plasticity in the GI tract at both morphological and functional level. Demir, I. E., Tieftrunk, E., Schäfer, K. H., Friess, H., Ceyhan, G. O. Simulating Pancreatic Neuroplasticity: In Vitro Dual-neuron Plasticity Assay. J. Vis. Exp. (86), e51049, doi:10.3791/51049 (2014). Neuroplasticity is an inherent feature of the enteric nervous system and gastrointestinal (GI) innervation under pathological conditions. However, the pathophysiological role of neuroplasticity in GI disorders remains unknown. Novel experimental models which allow simulation and modulation of GI neuroplasticity may enable enhanced appreciation of the contribution of neuroplasticity in particular GI diseases such as pancreatic cancer (PCa) and chronic pancreatitis (CP). Here, we present a protocol for simulation of pancreatic neuroplasticity under in vitro conditions using newborn rat dorsal root ganglia (DRG) and myenteric plexus (MP) neurons. This dual-neuron approach not only permits monitoring of both organ-intrinsic and -extrinsic neuroplasticity, but also represents a valuable tool to assess neuronal and glial morphology and electrophysiology. Moreover, it allows functional modulation of supplied microenvironmental contents for studying their impact on neuroplasticity. Once established, the present neuroplasticity assay bears the potential of being applicable to the study of neuroplasticity in any GI organ. Alterations in gastrointestinal (GI) nerve morphology and density have caught the attention of gastroenterologists and pathologists for a long time, but their relevance for the pathophysiology of GI diseases remains unknown1-3. Indeed, several highly common GI disorders such as gastritis, reflux esophagitis, colitis, diverticulitis, and appendicitis are associated with increased innervation density in inflamed tissue areas1. However, no genuine attention has so far been paid to the mechanisms and meaning of neuroplasticity in the GI tract. Do morphologically altered GI nerves differ from normal GI nerves, i.e. the normal state of the enteric nervous system, in terms of their function? What are the implications of altered neuropeptide/neurotransmitter content in plastic enteric nerves? Does peripheral neuroplasticity always entail altered signaling to the central nervous system? And where are the central projections of plastic extrinsic GI neural pathways? A long series of such key questions can easily be generated when looking at the paucity of our knowledge on the functional aspects of GI neuroplasticity. The study of GI neuroplasticity at functional level requires valid, reproducible and still easily applicable experimental models. In an era of increasing popularity and acceptance of genetically engineered conditional mouse models (GECoMM), such in vivo settings bear the potential to elucidate previously unknown facets of GI neuroplasticity in a realistic fashion1. However, the design and production of GECoMM remains costly, labor-intensive and, especially, time-consuming. Furthermore, they require the a priori selection of the target to be conditionally modulated in the genetically altered mouse (e.g. transgenic overexpression of nerve growth factor/NGF in enteric epithelial cells). Hence, for the design of a successful GECoMM, researchers need some indicators (e.g. previous experimental data) of a worthwhile target, i.e. that the molecule of interest (here NGF) can at least be expected to exert some biologically relevant effects on GI nerves. Such indicators can easily be derived from adequate in vitro models in which isolated cell subtypes from the complex microenvironment of an in vivo system can be selectively cocultured in a heterotypic manner4-7. The modulation of molecular targets in such a heterotypic culture setting is on average technically less cumbersome, faster, and can therefore aid in the prefiltering of worthwhile targets for verification in in vivo studies. 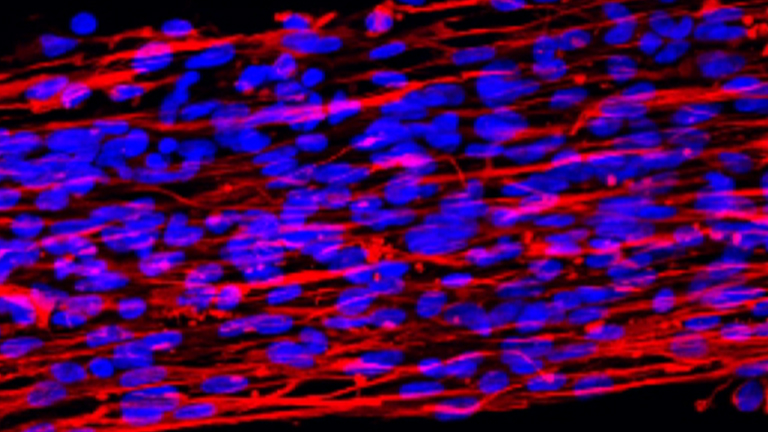 Recently, we presented an in vitro neuroplasticity assay which was designed to simulate the increased neural density and hypertrophy of intrapancreatic nerves in human pancreatic cancer (PCa) and chronic pancreatitis (CP) tissues. Here, neurons derived from newborn rat dorsal root ganglia (DRG) or myenteric plexus (MP) were exposed to tissue extracts from surgically resected PCa or CP tissues specimens and compared to those cultured in normal human pancreas (NP) tissue extracts5. Instead of tissue extracts, one can also use cell line supernatants to study the impact of selected cell types on neuroplasticity. When combined with a standardized morphometric measurement, the presented neuroplasticity assay allows valid and reproducible assessment of neuronal plasticity in response to different pancreatic microenvironments. Particularly, it allows the simulation of 1) morphological neuroplasticity, i.e. the changes in the neurite outgrowth, branching pattern and neuronal size, and 2) functional neuroplasticity, i.e. alterations in the excitability of peripheral neurons. Moreover, not only peripheral (i.e. enteric), but also central (e.g. DRG or second order spinal) neurons can be included in the present assay to assess their morphological and functional reaction to different GI tissue contents. In the present video tutorial, we demonstrate the technical protocol for the performance of this assay and discuss its advantages and weaknesses. Moreover, we draw attention to the applicability of the basic notion of this assay to the study of neuroplasticity in any GI organ. All animal experimental procedures in the protocol follow the animal care guidelines of Technische Universität München, Germany. The quality of tissue homogenization is critical to the subsequent detection of neuroplastic alterations in the cultured neurons. Here, a homogenizer is recommended which enables tissue dissociation without major increase in the tissue temperature. Transfer 5 mm x 5 mm x 5 mm cubes of pancreatic tissue directly from -80 °C to liquid nitrogen and place in a solid phase in the tissue homogenator. The ideal homogenator would dissociate the tissue fast enough, without allowing it to defreeze. Immediately after dissociation, resuspend the solid, powder-like homogenate in 300-500 µl of 0.1x phosphate-buffered saline (PBS). Here, do not use any lysis buffer (such as RIPA) since this may lyse the neurons. Centrifuge the homogenates for at least 15 min at the maximum speed of your bench centrifuge (e.g. 21,130 x g). Collect the clear supernatant which represents the tissue extract. Let the cells of interest reach at least 70 - 80% confluence in normal growth medium. Usually, these media contain serum components and may exert uncontrollable effects upon neuronal growth. Therefore, after reaching the desired cell density, wash your cells at least 3x with cell-culture grade PBS and place them in serum-free medium (SFM) for up to 48 hr. Note: Here, consider that some cells (like pancreatic stellate cells) may need serum in their growth media in order to maintain their normal state and structure. In such cases, perform serial serum dilutions in the medium of the cell of interest in order to find the lowest possible serum content necessary for intact cell function. Measure the protein concentration of the tissue homogenate or cell supernatants via Bradford protein assay. While these values vary depending on the tissue and cell type, for pancreatic tissue extracts, one would expect a concentration range between 5-12 µg/µl, and for cell line supernatants between 3-8 µg/µl. Depending on the concentration to be used in the assay, the final concentration of the extract or supernatant in the neuronal medium should be 100 µg/ml 5,8. Note: For an assay with neurons growing in 500 µl medium in each well of a 24-well plate, one needs 50 µg of protein from each extract or supernatant per well. At a typical extract concentration of around 10 µg/µl, one would need 5 µl of extract/supernatant for each well. In every setting performed as a triplicate, this would correspond to 15 µl of extract/supernatant. For different tissue or cell types, perform serial dilutions of the final extract or supernatant concentration and compare the observed neurotrophic effects between different extract/supernatant concentrations. Once the extract/supernatant collection is finished, carry on with isolation of neurons. For DRG neurons, collect the cervical to lumbar DRG of newborn rats between postnatal day (P) 2-12 after decapitation and stereomicroscopic dissection of DRG (Figure 1A). In order to have sufficient DRG neurons for a 24-well plate, collect all cervical to lumbar DRG of one newborn rat (equaling 52 DRG) per plate. Cut away the peripheral (neural) and central projections (roots) of DRG by means of microscissors. Leaving the projections in place impedes trituration and increases the contamination risk of culture by fibroblasts. For MP neurons, cut away the mesentery from the small intestine and manually and carefully strip off the seromuscular layer of the small intestine (for a detailed protocol on MP isolation, refer to Schäfer et al.9, Figure 1B). For MP, collect the plexus from two rats per 24-well-plate. Note: Try to be as gentle as possible in order to avoid tears in the seromuscular layer since they impede its successful separation from the small intestine. Collect the DRG and seromuscular layer in ice-cold minimal essential medium (MEM) supplied with gentamicin (20mg in 500ml medium) and metronidazol (2.5 mg in 500 ml medium). Following collection of DRG, incubate them in Hank’s Balanced Salt Solution (HBSS) supplied with collagenase Type II for 20-30 min. For MP isolation, incubate in collagenase type between 1-3 hr, depending on the age of the animal (Figure 1C). For MP, collect the net-like MP pieces under stereomicroscope and transfer to ice-cold MEM. Then triturate the DRG and MP through syringes with decreasing diameter. Note: Excessive trituration can destroy the neurons, but less the glia cells. Once the medium containing the DRG or MP has become cloudy, centrifuge the suspension at 93.9 x g for 5 min, discard the medium and resuspend in Neurobasal medium (supplemented with 100 U/ml penicillin, 100 μg/ml streptomycin, 0.5mM L-glutamine and 2% B-27). Count the total number of cells (i.e. neurons AND glia) by means of a hemocytometer. Note: The number of needed cells is dependent on the measurement parameter. For the quantification of neurite density, one needs denser cultures and thus a greater number of cells than for the measurement of neurite outgrowth, perikaryonal size and branching pattern of individual neurons. For neurite density measurements, use e.g. 10,000 cells (neuron+glia)/well or 1,500 neurons/well. For morphometry on individual neurons, brief (1 minute-long) trypsination of cells and seeding of 2,500 cells/well or 400 neurons/well is recommended. The typical yield of cells obtained from one rat is around 300,000-500,000 cells. Seed the cells on 13 mm coverslips which have been coated the night before and top the wells with Neurobasal medium (supplemented with 100 U/ml penicillin, 100 μg/ml streptomycin, 0.5 mM L-glutamine and 2% B-27) (Figure 1D). Note: Use poly-D-lysine (40 mg/m2) OR ornithine- and laminin-coated (1 mg/ml each) coated cover slips. Cells attach to poly-D-lysine extremely fast, thus making it suitable for experiments in which many cells are needed (i.e. neurite density measurements). Attachment to laminin is in general somewhat weaker, but laminin is a strong promoter of neurite outgrowth. Therefore, for measurements on neuronal branching and neurite length, prefer ornithine/laminin-coating. Allow the cells attach to the wells overnight. On the next day, prepare the extract-supplemented media (at a final extract/supernatant concentration of 100 µg/ml). Aspirate the seeding medium, and perform an optional, very gentle wash with PBS, and then slowly pipette the extract/supernatant-supplemented media (Figure 1E). Let the cells grow for 48 hr. Aspirate the media and fix in 4% paraformaldehyde for immunostaining (Figure 1F). Perform double immunofluorescence staining using neuron-specific (e.g. beta III-tubulin) and glia-specific (e.g. glial fibriallary acidic protein/GFAP) markers (Figure 1G). For morphometry, use an inverted light microscope equipped with a CCD camera in combination with automated software which allows measurement of neurite density (see Table). The neurite density of neuronal cultures is measured on 4-5 representative photomicrographs at 200x magnification from 4 different regions of densest growth on each coverslip by overlaying a 50 µm x 50 µm grid and counting the fiber density per square measured in the intersecting fibers. Neurite outgrowth, mean number of branches per neuron, the mean branch length and perikaryonal size can be measured from randomly selected 30 solitary neurons from each coverslip by marking the neurites and perikarya (Figure 1H). In the indicated age range of newborn rats (P2-12) and the seeding densities, MP and DRG neurons already build dense neuronal networks after 48 hr (Figure 2A). Comparison of neurite density between neurons cultivated in PCa, CP, and NP extracts reveals greater neurite density of DRG neurons in PCa or CP extracts than in NP extracts (Figure 2A)5. We particularly prefer MP neurons for measurements on individual neurons, since MP neurons tend to more easily dissociate from surrounding glia cells than DRG neurons. Here, MP neurons grown in PCa or CP extracts also build longer neurites and exhibit a more complex branching pattern than MP neurons growing in NP-extract containing medium (Figure 2B)5. The absence of this difference in neuronal morphology induced by NP, CP, and PCa extracts indicates a technical problem in the assay. In most cases, this may be due to 1) poor quality of the prepared extract due to long processing time or 2) due to damage to neurons that occurred during the isolation process. The neuroplasticity assay bears high enough sensitivity to detect alterations induced by the presence or absence of certain target molecules of interest in the supplemented extracts or supernatants. For example, the blockade of the neurotrophic factor Artemin or nerve growth factor from PCa cell (PCC) supernatants by adding specific blocking antibodies to NGF or by dynabead-induced depletion of Artemin results in attenuation of neuronal network formation (Figure 2C)10. In a recent study, we could show a very similar effect for the contribution of the neurotrophic factor Neurturin to neuroplasticity in CP in simultaneous comparison with other neurotrophic factors such as NGF, glial-cell-line-derived neurotrophic factor (GDNF) or transforming growth factor-beta (TGF-beta)11. The same approach can also be applied to assess the reaction of DRG-associated satellite glia cells or enteric glia to the pancreatic microenvironmental contents. Indeed, one of the most potent effects of PCa tissue extracts upon DRG- or MP-associated glia is prominent increase in the growth of glia (Figure 3)5. Furthermore, this effect is more pronounced in PCa than in CP. Here, one should consider that proliferation of glia should not be judged based on absolute glia counts, but rather on the relative proportion of glia cells to neurons (glia-neuron-index)5. This is particularly important to consider since the number of glia cells in these cultures is more difficult to control due to the proliferation potency of glia as opposed to neurons. Figure 1. Schematic protocol of the in vitro neuroplasticity assay. The present assay makes use of newborn rat dorsal root ganglia (DRG) and myenteric plexus (MP) neurons to study the impact of pancreatic tissue extracts or cell supernatants upon neuronal and glial morphology. DRG are collected after anterior laminectomy and MP-containing seromuscular layer after resection and mechanical stripping of the small intestine (A, B). After collagenase type II digestion, the neurons are seeded in the needed density (see text for details) ad cultivated for 24 hr (C, D). Then, the freshly prepared pancreatic (or from any GI organ of interest) extracts and cell supernatants are added in the growth medium of neurons at previously defined concentrations (E). After 48 hr, the cultures are fixed in 4% paraformaldehyde and double-immunostained against neuronal and glial markers (F, G). The neuronal morphology, including neurite density, neural branching pattern and perikaryonal size are measured by means of a standardized software protocol (H). Please click here to view a larger version of this figure. Figure 2. Pancreatic neuroplasticity induced by human pancreatic cancer (PCa) and chronic pancreatitis (CP). 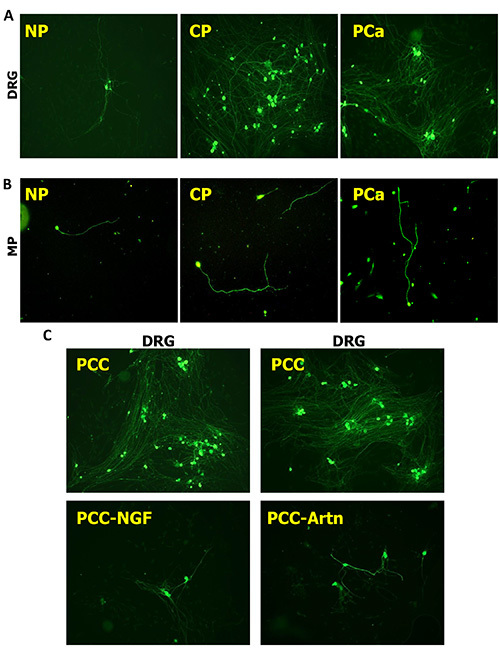 Human pancreatic tissue extracts surgically derived from normal pancreas (NP), CP or PCa tissues induce prominent differences in the neurite density of DRG neurons (A) and in the neuronal branching pattern of MP neurons (B). Here, PCa and CP tissue extracts exert a prominent neurotrophic effect upon DRG and MP neurons. Similar to tissue extracts, also the supernatants of individual cell types (here pancreatic cancer cells/PCC) also remarkably increase the neurite density of DRG neurons (C). This increase, however, is reversible when selected neurotrophic factors such as artemin (Artn) or nerve growth factor (NGF) are depleted or blocked with these supernatants. All neurons immunostained against beta-III-tubulin. All images at 100X magnification. Please click here to view a larger version of this figure. Figure 3. Glial reaction to pancreatic microenvironmental contents. Pancreatic tissue extracts from PCa or CP tissues not only have a neurotrophic effect, but also enhance glial growth and glial cell counts in DRG or MP cultures. Glia cells immunostained against the glia marker glial fibrillary acidic protein (GFAP). All images at 200X magnification. Please click here to view a larger version of this figure. The present protocol is intended to illustrate the methodology behind the in vitro pancreatic neuroplasticity assay which was recently developed by our group to study the mechanisms of neuroplasticity in PCa and CP5. The protocol involves a three-day procedure which can easily be applied once the performer has gained sufficient experience in the isolation and culture of DRG and MP neurons. Furthermore, it represents a valuable tool for studying the concomitant reaction of enteric and DRG-associated glia to pancreatic microenvironmental components. In our opinion, one of the most interesting features of this assay is its ability to detect and simulate the alterations that occur during PCa and CP (i.e. neural sprouting and hypertrophy) in a simplified in vitro setting. Indeed, application of tissue extracts or cell supernatants results in changes in neuronal morphology which can be detected with sufficient sensitivity by means of systematic morphometric analysis. Recently, we could also demonstrate that this assay is also sensitive to detect the differences in the neurotrophic potential of several cancer entities in simultaneous comparison: When the neurotrophic attributes of PCa cell lines was compared to cell lines from colorectal cancers, PCa cell lines induced significantly greater neurite densities among DRG neurons than colorectal cancer lines8. Even in the comparison of rectal vs. colon cancer cell lines, colon cancer cell lines were inferior to rectal cancer cells in terms of their neuroplastic potential8. One of the key advantages of this assay is its easy accessibility for not only morphometric, but also electrophysiological analyses. As opposed to in situ neurons in slice preparations, recordings from neurons in our assay within defined media or in the absence/over-presence of defined factors are technically not demanding and can deliver valuable information on the role of selected molecules in these microenvironments on neuronal activity. Certainly, the presented assay should not be regarded to be solely restricted to the study of questions related to pancreatic neuroplasticity. Neuroplasticity is a prominent feature of the entire GI tract under pathological conditions, such as inflammatory enteric neuropathies1-3. All these conditions were reported to be associated with changes in innervation morphology and altered neuronal activity1-3. Hence, it is conceivable to replace pancreatic tissue extracts or cell lines by those derived from the corresponding tissues and study their specific impact on neurons and accompanying glia. Our recent analyses on the comparison of pancreatic and colorectal cancer tissues support this notion8. However, it is also plausible to assume that components of different tissue microenvironments may not induce as sensitive and representative alterations as we routinely observe in pancreatic tissue components. Therefore, we recommend the previous extensive assessment of neuronal morphology induced by “positive” control tissues (i.e. tissues with e.g. histologically demonstrated neural hypertrophy) versus “negative” control tissues (i.e. with no histological evidence for neural hypertrophy). Our former analyses on the reaction of glia in this assay were limited to the determination of glial cell counts in different pancreatic microenvironments. Glia cells possess emerging importance in neurobiology since the recognition of their neurogenic potential and increased interest in calcium currents along glial membrane12. Therefore, glia cells in this assay are also easily accessible to further functional analyses by novel approaches. However, such additional innovative approaches need previous extensive validation before their application for further studies. Like any other experimental assay, also the presented neuroplasticity assay bears some limited comparability of human tissue samples obtained from different patients undergoing surgery. It is imperative for these tissues to be derived from same tissue regions (e.g. pancreatic head, from the main tumor mass) for reliable analyses1. Furthermore, even when this prerequisite is fulfilled, further differences in tissue or tumor biology cannot be excluded considering the large variation in the biological response pattern of different individuals1. To circumvent these individual tissue differences, we recommend the performance of the assay with tissues obtained from as many patients as possible, i.e. with at least 5 - 10 different patients per entity. As a key technical aspect, we would like to draw attention to the role of coating substances on neuronal growth. As also mentioned above, we prefer poly-D-lysine for measurements on neurite density, and ornithine/laminin coating for those on individual neuronal branching/outgrowth pattern. In our hands, whereas measurement of neuronal outgrowth can also be performed on poly-D-lysine-covered surfaces, we find that this approach tends to decrease the sensitivity of the assay for the actual differences. Therefore, researchers applying this assay should ensure the usage of the optimal coating material for their question of interest. In summary, we believe that the presented neuroplasticity assay represents a valuable tool to obtain fast and reproducible information on neuro-morphology and neuro-function in different tissue microenvironments, as demonstrated in the example of pancreatic tissue. The sensitive detection of differences in neuro-morphology as induced by different pancreatic tissue contents underlines the in vitro reproducibility of pancreatic neuroplasticity in human PCa and CP. Future efforts shall aim at optimized preassay screening of applied supernatants and extracts to attain the best defined media for the study of GI-disease-associated neuroplasticity. The authors have no competing interests and no financial disclosures. All authors contributed towards the establishment and validation of the presented assay and to the draft of the manuscript. Demir, I. E., Schafer, K. H., Tieftrunk, E., Friess, H., Ceyhan, G. O. Neural plasticity in the gastrointestinal tract: chronic inflammation, neurotrophic signals, and hypersensitivity. Acta Neuropathol. 125, 491-509 (2013). Vasina, V., et al. Enteric neuroplasticity evoked by inflammation. Auton. Neurosci. 126-127, 264-272 (2006). Lomax, A. E., Fernandez, E., Sharkey, K. A. Plasticity of the enteric nervous system during intestinal inflammation. Neurogastroenterol. Motil. 17, 4-15 (2005). Demir, I. E., et al. Neural Invasion in Pancreatic Cancer: The Past, Present and Future. 2, 1513-1527 (2010). Demir, I. E., et al. The microenvironment in chronic pancreatitis and pancreatic cancer induces neuronal plasticity. Neurogastroenterol. Motil. 22, 480-490 (2010). Schafer, K. H., Mestres, P. The GDNF-induced neurite outgrowth and neuronal survival in dissociated myenteric plexus cultures of the rat small intestine decreases postnatally. Exp. Brain Res. 125, 447-452 (1999). Schafer, K. H., Van Ginneken, C., Copray, S. Plasticity and neural stem cells in the enteric nervous system. Anat. Rec. 292, 1940-1952 (2009). Liebl, F., et al. The severity of neural invasion is associated with shortened survival in colon cancer. Clin. Cancer Res. 19, 50-61 (2012). Schäfer, K. H., Saffrey, M. J., Burnstock, G., Mestres-Ventura, P. A new method for the isolation of myenteric plexus from the newborn rat gastrointestinal tract. Brain Res. Brain Res. Protoc. 1, 109-113 (1997). Ceyhan, G. O., et al. Nerve growth factor and artemin are paracrine mediators of pancreatic neuropathy in pancreatic adenocarcinoma. Ann. Surg. 251, 923-931 (2010). Demir, I. E., et al. Neuronal plasticity in chronic pancreatitis is mediated via the neurturin/GFRalpha2 axis. Am. J. Physiol. Gastrointest. Liver Physiol. 303, 1017-1028 (2012). Joseph, N. M., et al. Enteric glia are multipotent in culture but primarily form glia in the adult rodent gut. J. Clin. Invest. 121, 3398-3411 (2011).